EDCOE operates from the core principle that children hold the future of the nation, and their education is its greatest responsibility. In El Dorado County, children come first so resources are maximized with the commitment to recruiting innovative educators, building better schools and developing stronger partnerships with government, private industry, community-based organizations, non-profits and small businesses. At the same time, EDCOE and its school districts are fiercely committed to providing excellence in education for the 21st Century, while maintaining sound management practices and care in how tax dollars are spent. As demonstrated by our comprehensive student programs, EDCOE always has and will continue to passionately advocate on behalf of El Dorado County students, families, and community. 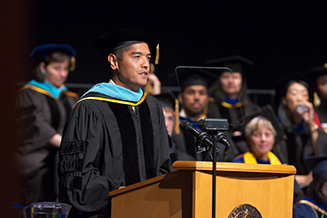 Transcript of Dr. Manansala's Commencement Address.